It is an another exciting mysterious novel of the above said author. It is difficult to find a reader who dislike Shirshendu Mukhopadhyay's writings. He is a very prominent and modern Bengali author. His written notable mysterious novel are- Bikeler Mrityu, Kapurush, Rin, Aloy Chhayay, Projapotir Mrityu O Punarjanma etc. 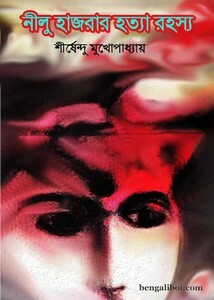 Now I want to share mystery novel 'Nilu Hajrar Hotya Rahosyo' as ebook pdf. The pdf has 111 pages, 3mb file size. Collect the Bengali mysterious story book as pdf download- 'Nilu Hajrar Hotya Rahosyo by Shirshendu Mukhopadhyay'.